Made this tonight: Sauté 1.5 onions (that’s what I had: one large red onion, 1/2 sweet onion) and this tempeh (sliced into slabs, then across into rectangles) in 2 Tbsp bacon fat (or olive oil). I then added 8 cloves minced garlic, salt, lots of freshly ground black paper, 1.5 Tbsp ancho chili powder, 1.5 Tbsp ground cumin, 2 Tbsp Mexican oregano, and 2 tsp thyme and sautéed that for a while. Then I added black beans that I had cooked (1 c dried Black Valentine beans, simmered for a little over an hour without pre-soaking them, and then drained when they were done), along with one 14.5-oz can diced tomatoes, 1 can Ro-Tel Original tomatoes with green chili, one 7-oz can Ortega Fire-Roasted diced green chiles, about 1 Tbsp liquid smoke, 2 tsp soy sauce, and 2 tsp rice vinegar. I simmered that covered for 30 minutes. Tasty served with grated cheese on top. Police in Rohnert Park, Calif., raid the home of a man who posted critical comments about them online. The police chief says the raid came after someone called 911 to report a woman screaming inside the man’s home, but there was no woman, and the chief now refuses to release the recording of the 911 call. How one person can reconcile such opposing views of football — as both cherished American tradition and trivial activity so violent that it strips away our humanity — is hard to see. Borland, 24, is still working it out. He wants to be respectful to friends who are still playing and former teammates and coaches, but he knows that, in many ways, he is the embodiment of the growing conflict over football, a role that he is improvising, sometimes painfully, as he goes along. More than anything, Borland says he doesn’t want to tell anyone what to do. This is the central conflict of his post-football life. He rejected the sport, a shocking public act that still reverberates, in tremors, from the NFL to its vast pipeline of youth leagues. Yet he’s wary of becoming a symbol for all the people who want to end — or save — football. We trailed Borland for five months as he embarked on a journey that drove him deeper into the NFL’s concussion crisis and forced him to confront the sport in ways he avoided while playing. One day in June, he returned to Archbishop Alter High School in Kettering, Ohio, to visit with his old coach, Ed Domsitz. “We’re in a period now where, for the next 10 or 15 years, many of us, we need to figure out a way to save this game,” said Domsitz, a southwest Ohio legend who has coached for 40 years. Jovial and gray-haired, Domsitz was standing on the Alter practice field, a lake of synthetic green turf. He tried to recruit Borland to his cause. “Some of my best tackles were the most dangerous!” Borland responded, laughing. “You’re exactly the kind of people we need,” the coach insisted. In the months following his retirement, Borland has offered himself up as a human guinea pig to the many researchers who want to scan and study his post-NFL brain. He has met with the former vice chief of staff of the U.S. Army and with mental health experts at the Carter Center in Atlanta. He has literally shrunk, dropping 30 pounds from his 248-pound playing weight while training for the San Francisco Marathon, which he ran in late July. As the Niners reported to training camp in July, Borland was examining the Book of Kells, a 1,200-year-old manuscript, at the Trinity College Library in Dublin, the start of a six-week European vacation. In many ways, Borland is like any bright, ambitious recent college graduate who is trying to figure out the rest of his life. In other ways, he’s the most dangerous man in football. On that day back in April, Borland stared hard at his iPhone, pondering what to do about the NFL’s summons to a post-retirement drug test. The league says it reserves the right to test players — even after they’ve retired — to ensure that they don’t dodge a test, then return. But given the stakes, and the NFL’s dubious history on concussions, it occurred to Borland that maybe, just maybe, he was being set up. “I don’t want to be a conspiracy theorist,” he says. “I just wanted to be sure.” Borland agreed to submit a urine sample to the NFL’s representative, who drove in from Green Bay and administered the test in the Wisconsin trainer’s room. Then he hired a private firm for $150 to test him independently. Both tests came back negative, according to Borland. “I don’t really trust the NFL,” he says. It’s tempting to draw parallels between Borland and Meggyesy, both of whom reject the NFL’s easy narrative of cartoon violence and heroic sacrifice. Late in his pro career, Meggyesy was benched for his political activism. At Wisconsin, in 2011, Borland was punished with extra conditioning for skipping class to protest Republican Gov. (and current presidential candidate) Scott Walker, who was trying to limit collective bargaining for public employees. Borland marched with three cousins, one a teacher, and carried a sign that read: recall walker. But there are significant differences between the two men. . .
Robert Stern [is] a neurology professor at Boston University, the leading institution for the study of chronic traumatic encephalopathy, or CTE. Over the past decade, the disease has been found in the brains of 87 out of the 91 dead NFL players who were examined. In late February, a BU-hosted “consensus conference” concluded that CTE is a distinct neurodegenerative disease found only in patients who experienced brain trauma. The NFL rejected its link to football for years. Hudson writes from his most powerful perch in chapters describing how these financial parasites have tricked our society into accepting them as a normal, productive part of our economy. (Since we write about these thousands of diabolical tricks four days a week at Wall Street On Parade, poignant examples came springing to mind with every turn of the page in “Killing the Host.” From the well-placed articles in the Wall Street Journal to a front group’s pleas for more Wall Street handouts in a New York Times OpEd, to the dirty backroom manner in which corporate speech was placed on a par with human speech in the Supreme Court’s Citizens United decision, to Wall Street’s private justice system and the Koch brothers’ multi-million dollar machinations to instill Ayn Rand’s brand of “greed is good” in university economic departments across America — America has become a finely tuned kleptocracy with a sprawling, sophisticated public relations base. Similarly, when citizens rise up en masse to demand a realignment of their economy, as happened with the Occupy Wall Street movement, first the public relations masterminds dismiss them as an unhinged gathering of smelly hippies, followed by their violent eviction in the middle of the night, with military precision, by the Praetorian Guard of the kleptocracy. In Manhattan, the Praetorian Guard (NYPD) has a high-tech surveillance center mutually staffed by cops and Wall Street personnel – andmainstream media find nothing unusual about this. Chapter 8 of “Killing the Host” begins with this quotation from John Maynard Keynes: “When the capital development of a country becomes a by-product of the activities of a casino, the job is likely to be ill-done.” Hudson expands further: . . . In the Guide I discuss two mindsets: explorers and settlers. Explorers are risk-tolerant and novelty seeking, looking for any excuse to try something new; settlers are risk-averse and prefer the familiar, looking for any excuse to stick with the status quo. I mention that the same differences are seen in the animal kingdom, where they are generally called “bold” and “shy” respectively.
. . . Some [ant] colonies are full of adventurous risk-takers, whereas others are less aggressive about foraging for food and exploring the great outdoors. Researchers say that these group “personality types” are linked to food-collecting strategies, and they could alter our understanding of how social insects behave. When they reviewed their data, . . .
There’s quite a bit more, and it’s interesting. A perfect result today, thanks to a two-day stubble, excellent prep, and the DLC slant. The Vie-Long horsehair brush shown is a favorite. I really do like the feel and performance of a good horsehair brush—a distinct feel that differs from that of badger, boar, or synthetic. And the performance is excellent. 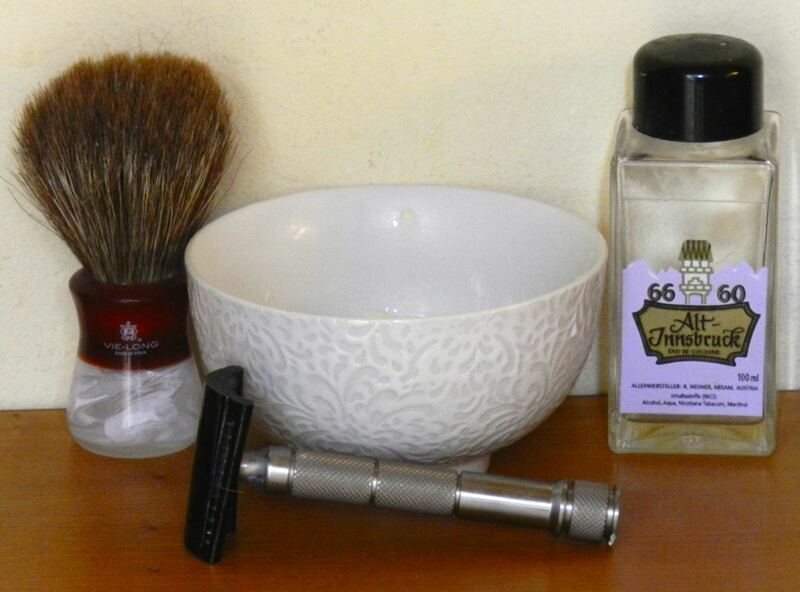 This is the fifth shave with the sample of Meißner Tremonia’s Pots o’ Milk shaving soap, and it’s still going strong. I would guess that three more shaves are in the offing. I’ve been mentioning recently about how I must be careful to use the iKon stainless slant (and this head is stainless beneath the DLC coating) with light pressure, particularly with the SE handle, which is heavy. But I seem to have unconsciously learned the pressure lesson: I took no special care today, using the razor in a way that (now) seems natural. No nicks at all and a BBS result. I did note that the blade probably requires replacement, based on the slight resistance I felt from the stubble. A splash of Alt-Innsbruck, with one shave left in the bottle. I do like this aftershave a lot, but I think I won’t replace it: I have too many others to use up. But I’ll still recommend it to your attention. Wonderful start to the week. Quite a few years ago I read John Barth’s novel The End of the Road, whose protagonist was discovered in the Baltimore train station by the Doctor, immobilized—cataleptic, really—with being unable to decide on a destination. At the end of my last session — it had been decided that I was to return to Baltimore experimentally, to see whether and how soon my immobility might recur — the Doctor gave me some parting instructions. I continue to use those three rules when I can’t decide between two alternatives. Words to live by.